Serving each other as we Connect! Hello Ladies! What an exciting start to our Winter Session Last week. 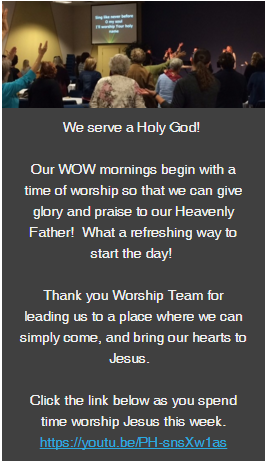 This week we will meet for a time of worship and then break into our small groups. 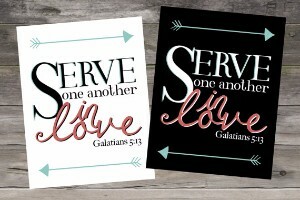 Our theme once again is Galatians 5:13 – “Serve one another in love”. We have heard many testimonies from people that they have felt the love of Jesus through receiving meals, gifts, and other acts of service through their friends at WOW. Thank you for creating that amazing atmosphere! Craig Groeschel DVD – bring a notebook! Snacks – We won’t have a snack list this session, so please bring something to share if you are so inspired! No worries – connect with one of the leaders and we can help you decide what study might be best for you this session!